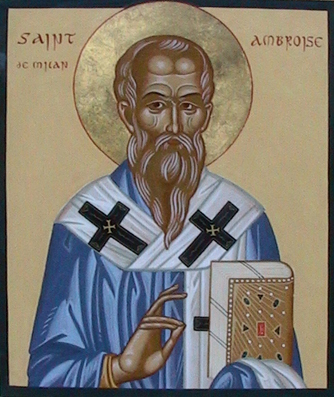 In 373, while serving as governor in Northern Italy, Ambrose became involved in the election of the Bishop of Milan as the mediator between the battling factions of Arians (those who believe the Word of God to be a creature) and Athanasians (those who believe the Word of God is fully divine even as the Father is divine). This was an important election because the victorious party would control the powerful See of Milan. It seemed likely that rioting would break out. Ambrose exhorted both sides to keep the peace and obey the law. Suddenly both sides cried out, “Ambrose shall be our bishop.” Ambrose protested but the people persisted. Though brought up in a Christian home Ambrose had not been baptized. He was hastily baptized and ordained bishop on December 7, 373. Ambrose died April 4, 397, but because this date so often falls in Holy Week or Easter Week he is commonly remembered on the anniversary of his consecration as bishop. Lord Jesus Christ, you are for me medicine when I am sick; you are my strength when I need help; you are life itself when I fear death; you are the way when I long for heaven; you are light when all is dark; you are my food when I need nourishment.